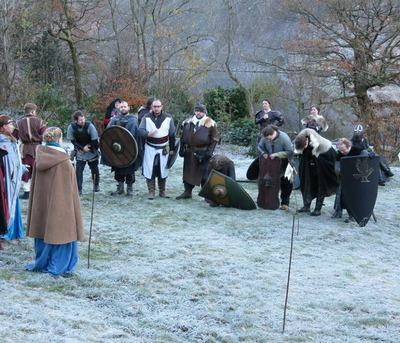 EDIT: Booking is now CLOSED for Circa Regna Tonat: The Wager of Battle. You can secure a place by paying a deposit of £15. You can pay either here on the website via the paypal button below, or get in touch with us via email or facebook to arrange an alternative payment method. It is the Year of Our Lord 560 and the isle of Britain writhes in the anguish of civil war. For over a hundred years the Red Dragon of the Britons battled the White Wyrm of the Saxons, but that age is passing, along with the pagan faith which the invaders brought with them. Now a bishop sits in almost every kingdom of Britain and for more than two decades, on almost every Sabbath, Saxons and Britons are joined in the sacrament of marriage, following the example of the royal families of Wessex, Mercia and Rheged. Yet even as the Saxon kingdoms were drawn ever closer to the renewed light of Camelot, the empire Arthur had imposed his peace upon fell away from its fountainhead. After the death of Arthur at Camlan, the land cried out for harmony and renewal, yet there has been no lack of foreign wars to fight so that across the seas the ideals of Camelot could be upheld. This terrible burden was for many years borne by Constantine, until the old king’s death, in the Year of Our Lord, 551. Thereafter, with the heir to the throne a boy of five, the regency fell to Constantine’s young wife Anna. While some called her rule wise and fair, others found no redress to their grievances and the court of Camelot teemed with anger, pride and lies. In castle halls men spilled wine rather than toast the young Prince, while the Queen Regent, determined to defend Camelot and its allies, raised new men to the heights of her favour, and snubbed families of ancient pedigree. When the banners were finally raised in rebellion in the Year of Our Lord, 557, and the land became divided against itself, many churchmen preached that the Last Days were at hand and the immanency of the Parousia. Thus far Judgement day has not come, for surely such great sin requires a greater penance of suffering, before the Lord will separate the wheat from the chaff. For three years the war scourged both the loyalists and the rebels, while Christ and his saints have surely slept. When the snows finally thawed in the spring of the Year of Our Lord, 560 it was before Camelot that the leaders of the rebels and some of Britain’s finest knights presented themselves, ready to put an end to that fratricidal conflict, and test the justice of their cause against the hazard of their bodies. They met the loyalists upon the field at Camlan. The Queen’s victory was total, and in a single day the almost all the great lords and proud knights who had challenged her rule fell into her hands. Yet the Lord giveth and the Lord taketh away, for upon the eve of her triumph she succumbed to an arrow wound received, supposedly, upon the very place Arthur fell. And so, despite their great victory, there has been no peace for the loyalists. Constantine’s son now rules as king, a boy of fourteen, who is said to be easily swayed. Some council mercy for the rebels, while others say mercy to traitors would surely only sow the seeds of future rebellion. While men of the cloth might preach that the field of battle has revealed the guilt of the traitors, others argue that Queen Anna’s demise was proof of her own misrule. 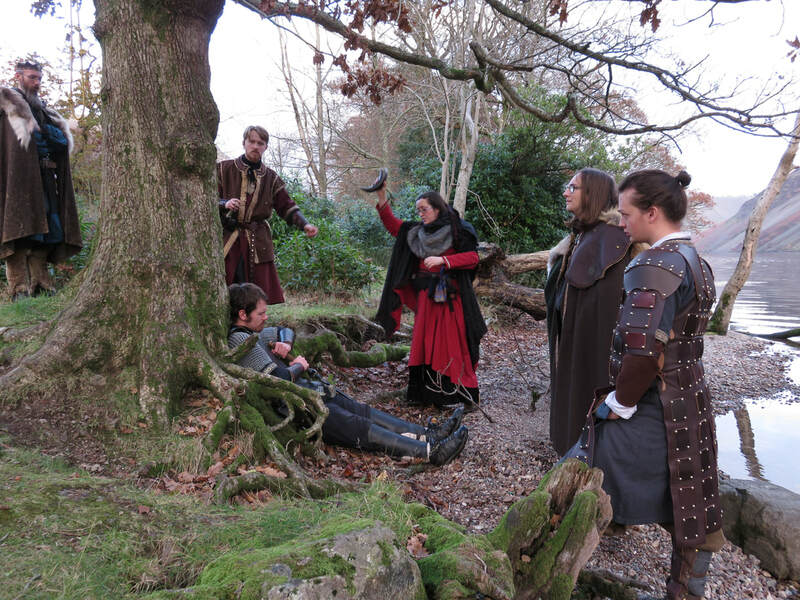 Circa Regna Tonat: The Wager of Battle is a weekend LARP set in a thoroughly ahistorical Dark Age Britain, heavily inspired by the Arthurian legends of Geoffrey of Monmouth and Thomas Malory. It is a character driven game of romance, drama, intrigue and action that will provide an immersive weekend. Though The Wager of Battle will be a complete story in it’s own right, it is a continuation in the setting we created for our first Circa Regna Tonat run in 2016. We are therefore excited to announce we can accept a small number of returning characters. If you are interested in playing your Circa Regna Tonat character again, please contact a ref to discuss the possibility of including them in this story. Please note that this may not be appropriate for every character and will be allocated on a first-come, first-served basis. The game will run from Friday November 9th - Sunday 11th, 2018 at YHA Eskdale. The full ticket price for this event will be £75, and a place can be secured by paying a £15 deposit. Booking opens at 6.00 on Friday 6th October 2017. Disclaimer: Loyalty is a blade with two edges. 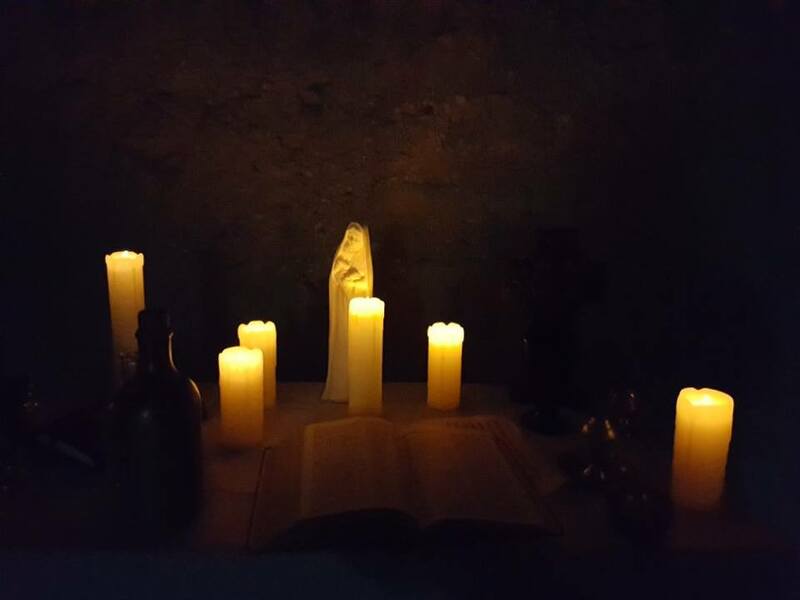 Welcome to the new blog for Shunned House's next LRP weekend project, a sequel to last year's offering - Circa Regna Tonat. This game will be a continuation of the setting and story of our last game, providing the same immersive and character-driven experience. Take a look at the first part of the story in our gallery. A weekend LARP event focused on player-driven drama.